Bayer Pearl’s foam insulation system used on the roofs of the Ain Al Fayda project. Revolutionary technology from Honeywell has gone into the making of a new foam insulation that is well suited to the region. Bayer Pearl has started using Honeywell’s Solstice liquid blowing agent (LBA) technology in its new polyurethane spray foam insulation to offer homeowners in the Middle East excellent thermal insulation performance and reduced energy consumption with lower global-warming impact. 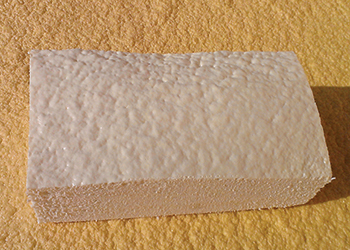 Foam blowing agents allow closed-cell polyurethane (PU) foam insulation to expand and provide the majority of the foam’s excellent insulating properties. Honeywell and Bayer Pearl have developed the new polyurethane spray foam system using the new blowing agent to be the most economical and competitive when assessed by performance and overall cost effectiveness. Insulation made with Solstice LBA has been shown to provide 10 per cent better thermal insulation performance than hydrocarbon blowing agents and four per cent better performance than hydrofluorocarbon (HFC)-based insulation foam. 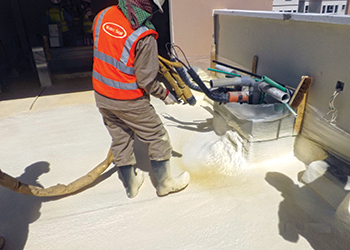 Foam made with Solstice LBA meets the sustainability requirement of GWP (global warming potential) less than five, as mandated under Estidama, a mandatory programme in Abu Dhabi which aims at constructing and operating buildings and communities more sustainably. 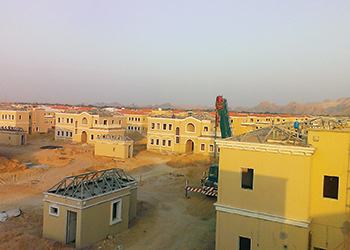 The Bayer Pearl spray foam insulation system has already been used in residential applications, with the system applied to the roofs of residential villas in Al Ain, by Water Seal. Honeywell innovation ... foam created with Solstice LBA. Water Seal also used the same roofing solution at Ain Al Fayda project in Abu Dhabi – the masterplanned community being built by Al Qudra Real Estate near Jebel Hafeet. Blowing agents from Honeywell are being rapidly adopted in a wide range of applications, including spray foam insulation, household refrigerators and freezers, insulated architectural panels, and refrigerated shipping containers. Solstice LBA, which is based on hydrofluoro-olefin technology, has an ultra-low GWP of One, which is 99.9 per cent lower than blowing agents it replaces and equal to carbon dioxide. It is non-ozone-depleting and nonflammable. Solstice LBA has received Environmental Protection Agency (EPA) approval under the Significant New Alternatives Policy (SNAP) programme, and is volatile organic compound (VOC)-exempt per the US authority. With an overall cost 74 per cent lower per sq m than a comparative water blown system, the new spray foam system is cost effective, Honeywell says. Honeywell’s new world-scale manufacturing plant for Solstice LBA started production in May 2014 in Louisiana, US, to meet the rapid increase in global demand. In addition to Solstice LBA, Honeywell’s family of Solstice-branded products includes stationary and mobile refrigerants, gaseous blowing agents, propellants, and solvents.